Lately, I’ve been trying to teach Niko how to give kisses. So far all he can seem to muster is coming in with his mouth wide open and then proceeding to slobber all over my cheek or neck. 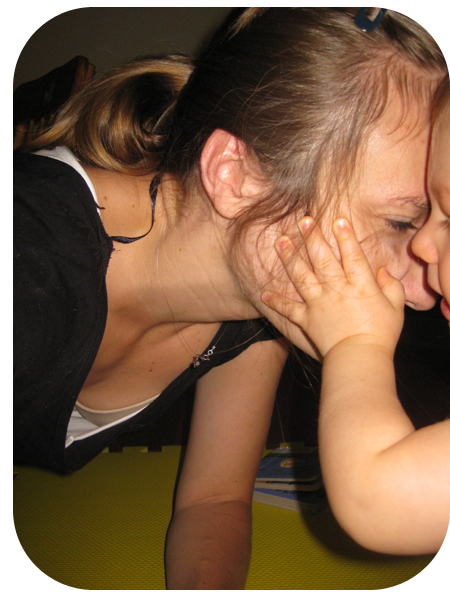 He seems to understand what it means when I say “Give Mama a kiss.”: it’s just that he hasn’t quite honed his technique yet. But the truth is, I actually enjoy these slobbery displays of affection. I realize this “baby” time is fleeting and later on (probably sooner than later) he will grasp how to give a proper kiss, and then these slobbery messes will be only a memory. So for now, as strange as this may sound, I’m relishing the baby slobber. Another way Niko has taken to showing his affection is by giving what we can only call the forehead hug. If he’s close to your face, and you ask for a kiss, he will reach out his little baby arms and hands, grab hold of your cheeks and pull your forehead to his. And in the midst of it all, he usually plants a wet one somewhere on the canvas of your face. It’s just so sweet. Although the result can sometimes be two foreheads colliding in somewhat of a “kerplunk”. He just does it so quickly that sometimes I don’t have time to slow down the movements to avoid the forehead smash. Either way, he doesn’t seem to mind and neither do I. Note: I tried to catch the forehead hug on camera, but it’s hard to take a picture at the same time as receiving one of these little hugs. Maybe when Daddy gets home, I’ll take a picture of him and Niko in action, in hopes that I can get a clearer shot of this too cute move. 2 Responses to "The Forehead Hug"